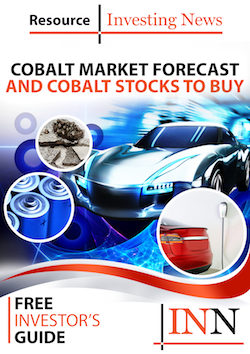 ERG, First Cobalt, Cobalt 27, Fortune Minerals, eCobalt Solutions, Global Energy Metals Corporation, ePower Metals and Canada Cobalt Works share their 2019 cobalt forecast. After a strong 2017, cobalt continued to make news headlines throughout 2018 as prices started to decline after the first quarter and the battle for the electric vehicle (EV) battery picked up pace. But what will happen to cobalt next year? To find out, the Investing News Network reached out to companies in the space to get their thoughts on what’s ahead for the battery metal in 2019. Benedikt Sobotka, CEO of Eurasian Resources Group (ERG); Michael Callahan, president and CEO of eCobalt Solutions (TSX:ECS); Robin Goad, president and CEO of Fortune Minerals (TSX:FT); Trent Mell, president and CEO of First Cobalt (TSXV:FCC); Anthony Milewski, CEO and president of Cobalt 27 (TSXV:KBLT); Michael Collins, CEO of ePower Metals (TSXV:EPWR); Frank Basa, president and CEO of Canada Cobalt Works (TSXV:CCW); Tim Fernback, president, CEO and director of Surge Exploration (TSXV:SUR), and Mitchell Smith, president and CEO of Global Energy Metals (TSXV:GEMC), shared their cobalt forecast for 2019. At the end of 2017, execs from cobalt-focused companies were very optimistic about future demand for the battery metal — a hope that has been challenged throughout the last 12 months. According to Milewski, in 2018 the market saw a large artisanal supply-side response out of the Democratic Republic of Congo (DRC). This material, in intermediate form, put pressure on prices. “A major issue around the additional cobalt supply are questions regarding the material’s sourcing, namely was it ‘ethically’ sourced?” Milewski added. Similarly, First Cobalt’s Mell said the amount of artisanal mining coming from the DRC was higher than anticipated, pushing deficit projections a little bit further out than originally expected. For his part, ERG’s Sobotka said that against the excitement surrounding EVs and growing demand for cobalt, in 2018 there was increasing scrutiny on the ways in which cobalt is sourced, and so it was expected that industrial miners would lead the way in developing an ethical supply chain. “Despite all the talk about sourcing sustainably, ethically and responsibly, many cobalt consumers have taken the easy route of sourcing from whomever supplies the cheapest material,” Sobotka noted. He said ERG expected 2018 to be a good year, but was wary of investors putting too much upward pressure on prices — particularly in China — and anticipated some volatility over the course of the year. According to Sobotka, the fundamental challenge in the cobalt market this year was that short-term supply overshot short-term demand. “We are at the very early stages of the lithium-ion battery boom. Battery electric vehicle production will accelerate over the next couple of years, and so will the application of batteries in energy storage systems,” he added. ePower Metals’ Collins said one of the most challenging aspects of the cobalt market this year was trying to deal with Tesla’s (NASDAQ:TSLA) Elon Musk and Panasonic (TSE:6752), both of which questioned the relevance of cobalt in the battery supply chain. Canada Cobalt Works’ Basa agreed, adding that the reality is that battery experts continue to maintain that cobalt cannot be completely removed from EV batteries. “[That’s because] it is necessary for long battery life and stability/safety to avoid battery explosions and fires … even with less cobalt in each battery, world demand for cobalt will triple from 100,000 tonnes in 2017 to 300,000 tonnes in 2030,” he said. Collins added that cobalt prices also suffered greatly from destocking in China as monetary policy tightened there and the trade war broke out with the US, preventing return of inventory levels. Looking over to how prices performed, eCobalt’s Callahan said he expected that the cobalt market and prices would be strong in 2018, which was not the case. “That of course hasn’t happened due to a sudden and unexpected increase in supply out of the DRC announced around mid-year,” Callahan added. As a near-term producer, the volatility in the price and the market were a challenge this year for eCobalt. First Cobalt’s Mell also highlighted the stock market’s performance as one of the big surprises and disappointments in 2018. “In 2017, the appetite for cobalt was there and then the space saw a big pullback due in part to big volatility in the market,” he added. Meanwhile, Basa said that in 2018, demand for cobalt continued to grow, pointing out that the price moved higher in the first part of the year. “While the price corrected in the second half, it is still double where it was two years ago,” he added. Fernback of Surge also commented on the shift in the market in the first and second parts of the year. “The first half of the 2018 year was a very positive economic climate and in the second half of the year, we saw the market becoming more volatile,” he said, noting that his company was able to position itself against future volatility by adding to its assets. According to ERG, from a demand perspective cobalt is one of the fastest-growing metals, but the question is whether supply can be reined in. “If operators that source artisanal supply are properly regulated, and artisanal miners are adequately remunerated, this segment — more than 25 percent of supply — will be more costly and less attractive,” Sobotka said. Looking beyond 2019, demand will gain even more momentum, and the lower prices drop over the next 12 months the higher they will rise after that. “In such a strong demand growth environment, low prices can come back to bite the industry in the medium term through even higher prices,” Sobotka added. For Cobalt 27’s Milewski, next year the industry will continue to figure out how to ensure that the cobalt supply chain is free from cobalt that is not ethically sourced. “In my opinion, the industry will need to move away from a self-certification model towards a Kimberley Process-style model,” he added. Milewski also suggested that investors new to the cobalt sector consider three things when creating a model: adoption rates of EVs, new energy vehicles and storage capacity; time for battery chemistries to evolve from nickel-cobalt-manganese 1:1:1 to 8:1:1; and DRC artisanal cobalt supply. ERG’s Sobotka also highlighted that it is important for investors to make up their minds about EV penetration, with a focus on battery EVs as they consume the vast majority of cobalt. “The future will require a lot of batteries. The world will see almost 200 new EV models introduced in 2019,” Sobotka said. His suggestion for investors is to look for projects that have the potential to have a meaningful impact on cobalt supply dynamics. Global Energy Metals’ Smith said 2018 was not a great year for the mining and metals market, and he expects that given the lack of uncertainty 2019 will start off the same. “That said, investor optimism will return to the sector and be attracted to those metals with strong fundamentals. Cobalt is very much one of those, especially given its critical role in the growing electrification of vehicles and need for new sources of supply. I’m very positive for cobalt long term,” he added. Looking ahead, eCobalt’s Callahan said he expects cobalt prices to recover somewhat given Katanga Mining’s (TSX:KAT) Kamoto supply disruption. “This should return some favorability to the market as a whole, and will hopefully have a positive influence on the equities as well,” he said. Callahan added that investors looking to jump into the market should be prepared for volatility and make sure they have a long-term outlook. “The next couple of years will be volatile as the market figures itself out, plus the real value driver — the EV story — won’t kick in until 2020,” he added. Fortune Minerals’ Goad explained that as EV penetration rates are accelerating, lithium-ion battery prices are also declining, making EVs cost competitive with cars powered by internal combustion engines and ranges comparable to a tank of gas. “The market will require high cobalt prices for a sustained period to ensure new mines come onstream to support the demand growth,” said Goad. In terms of supply, he said that with close to 70 percent of the world’s current cobalt mine supply, the DRC is positioning itself as the Saudi Arabia of the EV age. But China is also proactively consolidating its cobalt position as part of a strategic drive to lead the global race to EV mass adoption. “Needless to say, security of supply is important and geographic concentration of supply in countries with political and/or policy risks is a concern to companies looking for supply chain transparency and security of supply,” he added. Cobalt forecast 2019: What’s ahead for companies? 2019 will be a busy year for ERG, which started operations at its Metalkol RTR recently. At full capacity, the Metalkol facility will supply more than 120,000 tonnes per year of copper cathode and 24,000 tonnes per year of cobalt to the global market — volumes sufficient to power more than 3 million EVs per year. “Phase I of the project is nearing completion and is expected to reach initial commercial production rates early next year,” Sobotka said. For its part, Milewski highlighted Cobalt 27’s US$200-million Ramu transaction as one of 2018’s milestones — a streaming deal the company expects to close next year. Cobalt 27 is also looking to initiate a dividend in the next 12 months. For ePower Metals, 2019 will bring new assay results from its Panther Creek project in Idaho, its Brokopondo project in Suriname and new project announcements. Surge’s top 2018 milestone was “the inclusion of Mr. Bill Bennett to the team and the hiring of Wellington Shields, (a NYSE member firm from New York) as our investment banking and corporate advisory group,” said Fernback. Bennett is well connected having been BC’s mines and energy minister for over 12 years. The company’s 2019 catalysts “include the results of our winter 2018 exploration program in Ontario, and the start of our 2019 exploration programs in Chile with our recently acquired cobalt (Atacama Cobalto project) and lithium (Incahuasi lithium brine) assets,” he noted. The company also intends to spin out its copper-gold projects in BC, and plans to add another “high-profile and senior director” to its board, similar to Bennett’s caliber. Looking ahead, eCobalt expects to release a new feasibility study, sign offtake agreements and secure project financing in preparation for mine development at its Idaho cobalt project. Meanwhile, Canada Cobalt Works will be focused on obtaining government permits for a mill at the Castle mine property, arranging an offtake agreement for its cobalt sulfate with an Asian or European customer and drilling underground aimed at establishing a cobalt resource for the Castle mine. In 2019, Fortune Minerals will continue to work on the development of its NICO cobalt-gold-bismuth-copper project in Canada. “A new updated feasibility study assessing a 30-percent expanded project at current costs, and options to produce cobalt in concentrates, carbonate or sulfate, is expected to be completed in the new year,” Goad said. This study will be used to support project financing and to secure a strategic partner from a current pool of more than 40 companies currently under confidentiality agreements, he added. Finally, First Cobalt will continue to work on its Iron Creek project, delivering a second resource estimate that will significantly increase the resource size in late Q1 to early Q2 2019. “We intend to follow this up with some engineering studies and a preliminary economic assessment, which will allow us to show the market some preliminary economics as we continue to drill and grow the deposit,” said Mell. Editorial Disclosure: Fortune Minerals, eCobalt Solutions, First Cobalt, Canada Cobalt Works, Global Energy Metals, Surge Exploration and ePower Metals are clients of the Investing News Network. This article is not paid-for content.